LLLT (Low lever laser therapy) is a painless, sterile, non-invasive, drug-free treatment which is used to treat a variety of pain syndromes, injuries, wounds, fractures, neurological conditions and pathologies. Laser therapy can be used any time a patient requests or needs a drug-less procedure for the control of pain, when conventional therapies have been ineffective, or when the acceleration of healing from injuries is desired. Around the world, laser therapy is rapidly becoming a medical therapy that can heal wounds and fractures up to 60% faster and also reduce the cost of treatment for many conditions. In the UK, LLLT has become the treatment of choice for soft tissue “whiplash” injuries and for the treatment of painful post-herpetic neuralgia (shingles pain). Low level lasers supply energy to the body in the form of non-thermal photons of light. Light is transmitted through the skin’s layer (the dermis, epidermis and the subcutaneous tissue or tissue fat under the skin) at all wavelengths in the visible range. However, light waves in the near infrared ranges penetrate the deepest of all light waves in the visible spectrum. When low level laser light waves penetrate deeply into the skin, they optimize the immune responses of our blood. This has both anti-inflammatory and immunostimulate effects. It is a scientific fact that light transmitted to the blood in this way has positive effects throughout the whole body, supplying vital oxygen and energy to every cell. Some manufacturers produce devices with super luminous diodes (SLD) or light emitting diodes (LED). Monochromatic non-coherent light can be helpful for superficial wound healing, however, numerous studies have shown that lasers are far more effective due to their unique properties and penetration depth. Many super luminous & light emitting diode products are usually very low powered (typically 5 mW – 15 mW), and much of this energy is scattered, therefore requiring longer treatment times. See the chart to see how typical light penetrates the skin. LED’s will normally penetrate less than 1 cm. 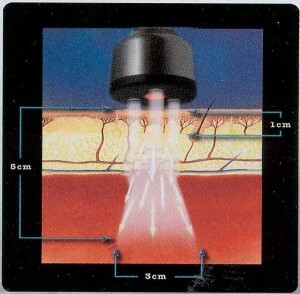 SLD’s are more powerful and can penetrate about 2.5 cm. But lasers at 830 nm can penetrate 5 cm. Far more effective than SLD’s and LED’s. Carpal tunnel syndrome (CTS) is a problem that affects the wrist and hand. If you have CTS, tingling and numbness can make even simple tasks hard to do. However, CTS can be treated, and your symptoms can be controlled. Reading this will help you better understand how low level lasers can help you. 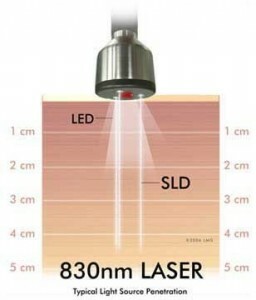 One of the most fascinating and used healing advances is the ML830 low level laser. On February 11, 2002, the U.S. Food and Drug Administration cleared the ML830 Cold Laser to be used in the non-surgical treatment and management of CTS. The Microlight 830 conducted double blind studies with General Motors and Baylor College of Medicine [and by the Woodlands and Clymer Healing Research Centers] as part of the clinical trials working with CTS. The ML830 laser was designed by a team of doctors and leading medical engineers to harness the therapeutic application of advanced low energy laser technology. The ML830 is a handheld, non-invasive, low energy, therapeutic laser. The ML830 produces infrared (invisible) laser light at the 830 nm (nanometer) wavelength and is classified by the FDA as a Class IIIB medical device. In cooperation with General Motors and several other clinical investigators throughout the Untied States, it was proved that the ML830 is an effective tool in the battle of pain. How does the ML830 work? 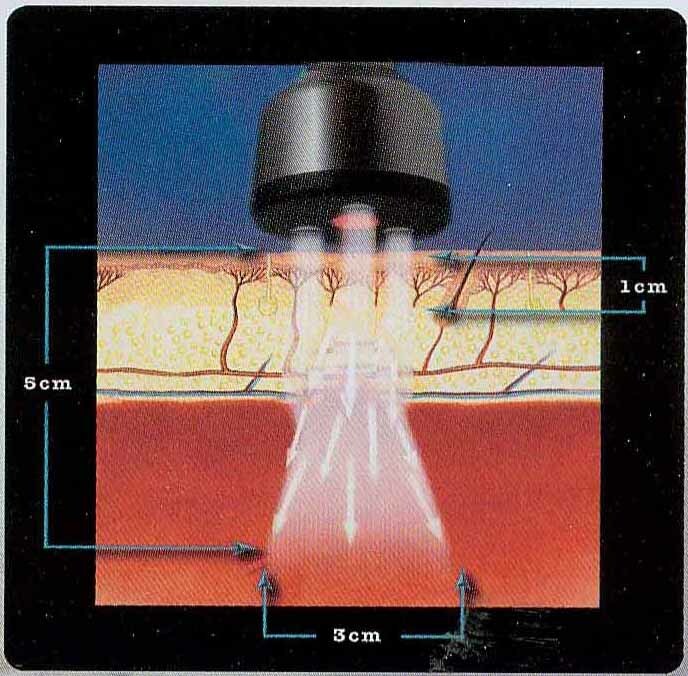 ML830 Laser is a non-thermal laser capable of penetrating deep into tissue. Once delivered, the light energy promotes the process of photobiostimulation. In human tissue the resulting photochemical reaction produces an increase in the cellular metabolism rate that expedites cell repair and the stimulation of the immune, lymphatic and vascular systems. 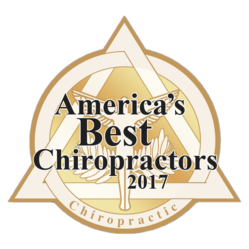 The net result, observed in clinical trials to date, is the apparent reduction in pain, inflammation, edema and an overall reduction in healing time. The ML830 has a wavelength of 830 nm (GaAlAs). A nanometer is a unit of length equal to one billionth of a meter. At 830 nm, the ML830 has a penetration capacity of approximately 5 cm with a 3 cm lateral spread. This is more than double the penetration that a 632 nm (HeNe) laser can provide (approximately 1 cm). With such greater penetration, many more tendons, ligaments, and muscle tissues are within the ML830’s reach. It is not an accident that the Microlight Corporation of America chose & patented the 830 nm technology for its ML830. There are 30+ years of clinical studies that proved the 830 nm range is the optimal wavelength. In Japan, where laser therapy is considered a preferred medical practice, Dr. Noriko Mochizuki et al published a clinical study on the effect lasers had on ATP (adenosine triphosphate). The scientists found that tissue levels of ATP were significantly increased when the target area was irradiated with 830 nm wavelength laser light. The study further stated that this beneficial increase in ATP production was not the result of temperature modification, but rather a direct response to the effect of laser light photons. This study also showed that while 830 nm wavelength laser light stimulated ATP increases, laser light at 632 nm showed no effect. In our experience the ML830, which has been affectionately called “the world’s most expensive flashlight,” has a multitude of uses. Perhaps the most appealing single factor about this unit is the possibility that it may help conditions where al previous therapies have failed. We are certain you can readily see how such an attribute would endear this unit to any dedicated practitioner.